Ambergris Caye is the largest island in Belize. Belize lies on the Eastern or Caribbean coast of Central America, bordered on the North by Mexico, on the West and South by Guatemala and on the East by the Caribbean Sea. It is separated by sea from it’s neighbour to the South-West, Honduras. The inner coastal waters are shallow and are sheltered by a line of coral reefs, dotted with over 200 ’cayes’ (islands, pronounced "keys"), extending the entire length of the country. The cayes range in size from a few hundred feet to 25 miles long and 4 miles wide. For the Ambergris Caye Field Guide, click here: https://ambergriscaye.com/fieldguide/ . The spectacular Belize Barrier Reef offers scuba diving which cannot be rivalled anywhere else in the World. It runs for 187 miles parallel with the coastline. There are only 4 atolls in the entire Atlantic region and 3 of them are off the coast of Belize. These immense atolls- (Lighthouse, Turneffe and Glovers) account for another 140 miles of reef making a total of some 337 miles of coral reef to explore in Belize. The area of the mainland and cayes is 8,867 square miles. The country’s greatest length from north to south is 174 miles and its greatest width is 68 miles. Literacy rate approximately 90%. At mid-year 2004, there were approximately 282,600 persons living in Belize. In April 2004, the number of jobless persons stood at 12,580 or 11.6% of the country’s labour force. Consumer-price inflation continued its upward trend, reaching its highest level (3.1%) in eight consecutive years. The economy is estimated to have grown by 4.2% as a result continued buoyancy in tourism and strong performances in the agriculture and construction sectors Reduced purchases by consumers and businesses alike were responsible for import spending falling by 6.9% to just over one billion dollars. Domestic export receipts rose by 7.5% to $410.1 million, with sugar, garments and papayas accounting for most of the increase. For more statistics on the Belize economy, click here: http://www.cso.gov.bz/welcome.html . 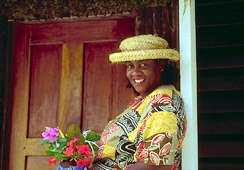 The main ethnic groups are Creole (African Descent), Mestizo (Spanish-Maya), and Garifuna (African Descent). There is also a number of people of Spanish and East Indian descent. The ethnic groups, however are heavily intermixed. There is also a small Mennonite community of European origin. The multi-racial make-up of the Belizean society includes Chinese, Arabs and other ethnic groups. The exact population of Ambergris Caye isn’t known, but estimates are that it is now at least 6,000. Posted : Marty Casado - Wed, Dec 6, 2006 11:59 PM. This article has been viewed 8664 times.